Time for the first post of the year...how exciting! In 2016, I hope to continue to do what I've been doing here - trying recipes that appeal to me and hopefully discovering some new family favorites in the process. At this point, we pretty much know what we like so the same themes will generally prevail...in other words, there will be lots of chocolate and I'll be keeping an eye out for simple yet scrumptious recipes. For the most part, the blog's focus will stay on the sweet side of happenings in my kitchen. While I actually cook more than I bake in "real" life, this blog is mostly my little sweet retreat and I think having a little something sweet really makes life better. One thing I love to eat and talk about, besides chocolate, is breakfast! Weekend morning breakfasts are a highlight of the week. Not only do we share something tasty to eat, we chat and linger around the table. It's an awesome way to start the day and connect with each other. Every so often, we have cinnamon rolls. Since I started making them in 2014 based on a small-batch recipe from Oh, Ladycakes, it's been a favorite. I even have a little cinnamon roll dance I like to do because I'm silly like that sometimes. I've made several versions (including some must-try almond buns) and this time, let's welcome peanut butter! I love peanut butter on an English muffin or toast in the morning so a cinnamon roll spin has been on my mind for some time. What could be easier than just grabbing some peanut butter and slathering it onto the dough for an easy and deliciously satisfying filling! You end up with ultra tender, soft, squishy rolls (trademarks of this cinnamon roll dough), filled with creamy and crunchy peanut butter (I used both) in each bite. If you like peanut butter, it's a no-brainer. I realized some time ago that you have to splurge and go for a glaze on your cinnamon rolls in most cases. Even just a little bit enhances the overall experience, adding an extra layer of sweetness, flavor, and a general feeling of indulgence that makes it feel all the more fulfilling. Considering there's just 1 tablespoon of butter and 4 teaspoons of sugar used to make this small-batch of 4 rolls, I think a little glaze is completely reasonable. So I whipped up a simple peanut butter glaze and I am wholeheartedly glad I did. Incidentally, I paired my peanut butter cinnamon roll with some Hong Kong style milk tea. I made an easy knock-off version, simply using strong black tea (steeping at least 2 English breakfast teabags for 2 cups of boiling water), sweetening it lightly with sugar, and stirring in evaporated milk until a creamy color emerges. I had leftover evaporated milk in the fridge after making a batch of Cantonese egg tarts for my in-laws over the holiday break and this tea was a great use of it. If only I had thought to serve the egg tarts with the milk tea! These peanut butter cinnamon rolls were actually our breakfast finale of 2015. We got a chance to have many "weekend" breakfasts in the last week or so, which was a serious treat. These rolls were a great way to wrap up a great year of weekend breakfasts. On New Year's day, I made smoked salmon "benedict" for my husband and I while the little guy had bacon and eggs with toast. Does anyone else feel like they've cooked about 85 meals in the last week? I have to admit it got a bit exhausting towards the end but felt ever so rewarding! In a small bowl or measuring cup, lightly stir yeast into the warm water. Add a pinch of sugar, cover, and set aside until slightly foamy, about 10-15 minutes. If the mixture does not foam at all after that time, you will need to start over (but at the same time, don't expect a great deal of foam given the small proportions). Turn the dough onto a lightly floured surface and roll or pat/press the dough into a 5x10 inch rectangle (I roll the soft, pliable dough out between parchment paper and plastic wrap). Spread the peanut butter evenly over the dough, leaving about 1/4 to 1/2-inch border along the sides. (If necessary, you can place the peanut butter in a dish and heat for 10 seconds in the microwave, then stir to loosen it up for easy spreading.) Sprinkle cinnamon on top of the peanut butter. Starting at the short end, tightly roll the dough, trim off the ends (optional), and slice into 4 even pieces. Place rolls into the prepared cake pan and place in a warm spot to rise again until doubled in size, about 30-60 minutes (60 minutes being optimal). [Do ahead: Once the rolls have been sliced and placed in the pan, cover and refrigerate overnight. In the morning, remove the pan from the refrigerator, set it in a warm place to rise again - this may take a bit more than an hour - and bake.] Bake in a 375 degree oven for 12-14 minutes. The rolls will still look fairly pale after baking. Let rolls cool slightly for about 5-10 minutes in the pan. In the meantime, make glaze by mixing milk into the confectioners' sugar, then whisking in peanut butter until smooth. Adjust with additional confectioners' sugar (or milk), as needed, until you have a fluid, spreadable consistency. Drizzle the glaze over the rolls and serve immediately, while still warm. Looks flavorful and super delicious. Happy New Year dear! Happy New Year to you, too, thanks! Fantastic! I have to try the peanut butter filling next time. They look really great, Monica. How easy can it get, right? Happy New Year! I think we made a lot of sweet memories this past week or so...for my husband and I, at least. ; ) The little guy seemed to enjoy himself. It's all been relaxing and very filling! Hope you had a great holiday! Happy New Year, Wendy! Thank you! Happy New Year and thanks for stopping by. Monica your peanut butter rolls are genius. I love English muffins and peanut butter for breakfast too but your rolls are a hundred times better. Hot out of the oven with a coffee, life does not get any better, Just out of curiosity what form of social media sharing site are you most active on ? I always share your recipes but want to know ones you prefer. Happy New Year, Monica! These cinnamon rolls are totally brilliant! I can never say no to soft cinnamon rolls and filling them with peanut butter is such a great and delicious idea! What a special breakfast and they must have been so so good with the tea! Love that you made egg tarts for your in-laws too - I have such a weakness for them too! Hi Kelly - Happy New Year! Hope you and the family had a good break and are kicking off 2016 with lots of cheer! : ) We cooked and baked and ate so much in the last couple of weeks!! Such fun but I'm ready for a little break now...just a little one. I'm sure you feel the same. I'll be eagerly anticipating all your lovely posts this year. Oh yum - I LOVE the idea of using peanut butter in cinnamon rolls. What a scrumptious treat! Happy New Year! They really hit the spot for me since I crave peanut butter at least 3x a week for breakfast! Happy New Year to you!! A cinnamon roll dance! I love it! I need to start doing one of those!! I absolutely love cinnamon rolls and with peanut butter?? Even better! Hope you are having a wonderful start to the new year!! haha, yes, Ashley...it goes something like "we do the roll, the roll...the cinnamon roll, the cinnamon roll!" and I have some moves to go with it! ; P It's my exercise in prep for eating the rolls. Happy 2016!! I love finding ways to sneak peanut butter into everything- these look delicious! Hi Monica, cinnamon rolls are on my list of things to make this year, peanut butter is one of my favorite flavors, these look delicious!!! I recently saw another recipe (larger scale) that interests me. I need some more cinnamon roll eaters around to share it with! I know you will cook up plenty of delicious things in 2016! I loveeee cinnamon rolls, but cinnamon rolls with peanut butter? These must be a million times better. Yum!! Peanut butter filling was just exactly as good as I pictured. Thanks! Boy oh boy Monica - you have done it this time! Brilliant recipe and I think I must try your beautiful dough too. What a smart and wonderful filling. And you only made a small batch! I would be tempted to make more than I needed then immediately regret stuffing two in my face! Love the tea - sounds great too. Beautiful and now I'm hungry! You are so sweet, Tricia. I am tempted to try another, larger-batch, recipe but these rolls are so seriously squishy and lovable that we keep going back to it. And as you said, it would be hard to not over-eat when there are a dozen sitting in front of you. I can't believe how hooked my family and I have become on these cinnamon rolls. The tea is a nice treat...you want to taste the tea but it's milky sweet (evaporated milk makes me think of childhood and Hong Kong...). Oh Lord have mercy!!! You just combined peanut butter and cinnamon rolls together! Heaven! Breakfast is my favorite meal, especially if it includes coffee and something sweet! 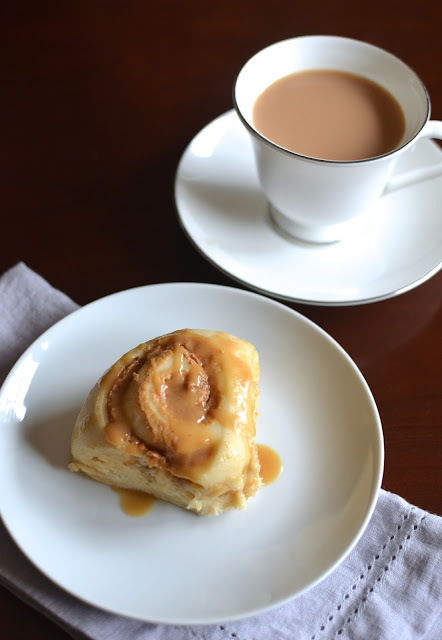 I would sooo look forward to breakfast and wake up extra early if it included those peanut butter cinnamon rolls! I love a good breakfast, particularly a drawn-out weekend one. I'm glad these would get you up early. My husband wakes up early on weekends to have breakfast with us. I'm an early bird and he would sleep in far later given the option. You certainly know how to start the year off in style Monica!! Perfect comfort food to set you up for a cold, January day. I can only imagine how great the crunchy, salty, sweet filling is....Great job! Oh my why haven't I thought of this combination before? I love cinnamon and peanut butter, but combining them together is such a splendid idea and a great way to start 2016 ;) Happy New Year to you and your family Monica! It's the best shortcut, too...just slather that PB over it and sprinkle on as much or as little cinnamon as you like. Toss in some shaved chocolate if you feel reckless. haha. Happy New Year, Jasline! I am craving these little baby cinnamon rolls a little too often! : ) Enjoy the weekend. Going all out is something you gotta (and wanna) do sometimes so I hear you, Monica. ; ) I happen to have extra evaporated milk so the tea was a spur of the moment thing. Lots of sweetness going on. These buns were so simple but I'm kinda dreaming about them right now!